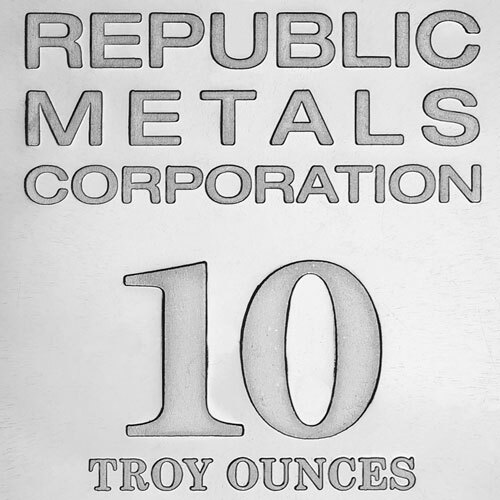 Each of these 10-ounce ingots of fine silver are a product of the Republic Metals Corporation. These finely-designed bars are a credit to the portfolio of all investors and make an impressive gift as well. In little over thirty years, the RMC Mint has established a distinguished reputation with investors around the world who appreciate the premium quality of their products and admire RMCs innovative ambitious spirit. This Miami-based metal refinery and mint has achieved the ability to function without dependence on grid-based energy sources by developing state-of-the-art green technology solutions without sacrificing efficiency. Investors also enjoy RMCs modern sense of esthetic design. Their trademark insignia is distinctive and attractive. It is featured on the obverse side of the ingot along with the specifications 10 TROY OUNCES, .999 FINE SILVER. The reverse side of the bar features a modern and stately design consisting of RMCs angled repeating insignia, which makes an elegant and handsome presentation. 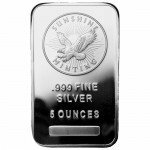 We are happy to offer an array of silver RMC bullion bars which are available in an assortment of other sizes. 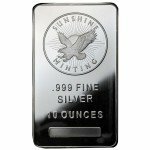 Silver.com also offers price reductions for larger quantities and a four-percent price reduction for orders paid by check and wire. 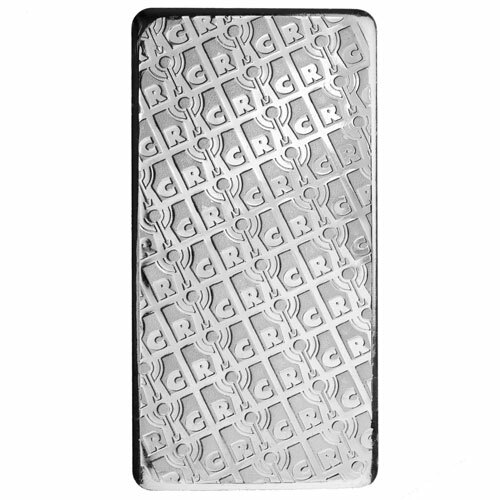 These brand new RMC bullion bars are shipped in their original sealed packaging. 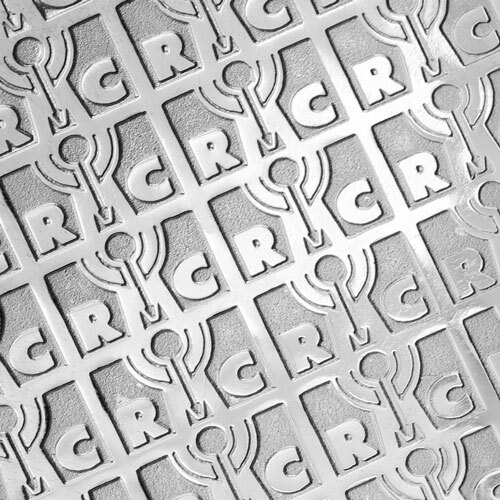 If you have any questions about these distinguished ten-ounce fine silver bullion bars produced by the Republic Metals Corporation or the ordering process, you can reach one of our representatives at 888-989-7223. Feel free to send us an email or use our live chat as well. 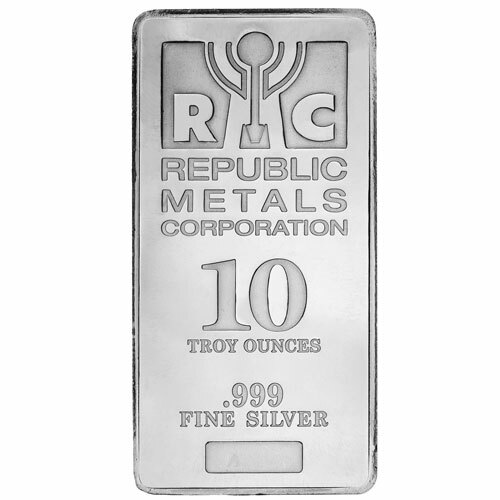 RMC Silver 10oz Bars. Nice and shiny, the feel of real money in your hands is a thing of beauty. Easy to hoard, easy to unload when the ruling class loses its mind and destroys the currency. No bank is ever going to look out for you unless you’re worth billions. When you drive your own boat, you answer to no Captain but yourself. Make ready for what’s to come. THESE ARE VERY NICE 10 OZ. SILVER BARS. THANK SILVER.COM. DON IN NY STATE.